MRT Carbon Fiber Effect Hood Struts for 1999-2011 Ford Mustangs.MRT is excited to announce that MRT Carbon Fiber Finished Hood Struts fit 2010 and 2011 Mustangs. There is a 5 day lead time on this special order item. Pictured is Black Carbon Fiber Finish - All exterior vehicle colors are available. Please call us at (734) 455-5807 for more details. These aftermarket Mustang hood struts eliminate the factory hood prop rod and give you the clean, pleasing appearance every engine compartment deserves. MRT Hood Struts are great for both show and street Mustangs - don't let that hood prop distract from all the power you've packed under the hood. MRT joined design teams to develop hood struts for your 2005-2011 or 1999-04 Mustang. 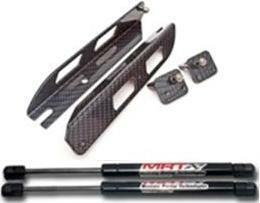 MRT's Mustang hood struts have since become one of MRT's bestselling products. The consistent customer satisfaction we have observed in response to our hood struts confirms their quality design. MRT Hood struts reuse OEM factory attachment points (Direct bolt on) and require NO holes drilled anywhere. These hood struts are easy to install on your Mustang - the only tool required is a 10mm wrench. Designed to function with the OE weighted hood. Anybody have MRT Headrests on a 2013-2014?